As a recent graduate from the University of Utah, I never really explored campus for anything besides classes and sporting events. Recently City Weekly has teamed up with the Utah Museum of Fine Art (UMFA) to present different artists and exhibits. Trevor Southey was the first event I attended with TheWord, let alone the first time I ever walked into the museum doors. His exhibit “Reconciliation” will be showing until February 12, 2011. Trevor, who is now 70 years old, is presenting the evolution of his career from Africa and England through his years locally in Utah and later in California. From oil, acrylic, etching and metal sculptures, Southey’s exhibit is for sure one everyone should come and check out. Last week UMFA hosted another new artist exhibition, Sophie Whettnall. Before she gave her speech about her work in the auditorium I noticed her Italian made Marni handbag before I even recognized it was the Belgian artist. A painter turned to video; her exhibit featured two videos and a wall drawing that covered the walls entering her exhibit. Known mostly from her video Shadow Boxing, Sophie has very modern art that pushes the envelope of what you would normally picture as typical artwork. In general The Utah Museum of Fine Arts is very unique in its dual role as a university and state art museum. It is Utah’s only visual arts institution that collects, exhibits, interprets, and preserves a comprehensive collection of original art objects. So come check out Trevor Southey and Sophie Whettnall’s exhibits on display now. Looking for a unique holiday shopping experience? 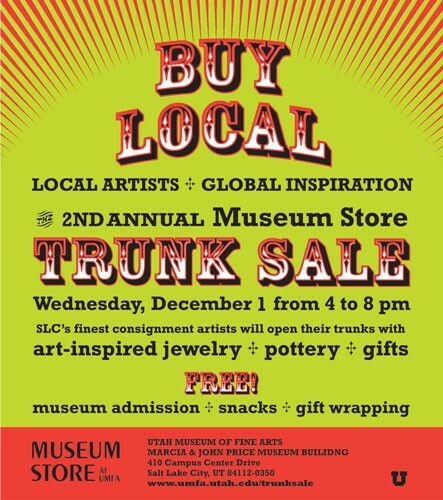 Our next event with UMFA is their 2nd Annual Trunk Sale. This is happening on Wednesday, December 1 from 4-8pm.At the Sale, you will find holiday music, tasty treats and many unique, hand-crafted gifts from local consignment artists. This event has become a fun holiday tradition at UMFA.